Mortal Kombat: Deception is a fighting video game developed and published by Midway as the sixth installment of the Mortal Kombat (MK) video game franchise. It was released for the PlayStation 2 and Xbox in October 2004, and for the Nintendo GameCube in March 2005. 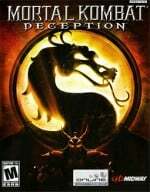 Mortal Kombat: Deception follows the storyline from the fifth installment, Deadly Alliance. Its story centers on the revival of the Dragon King Onaga, who attempts to conquer the realms featured in the series after defeating the sorcerers Quan Chi and Shang Tsung, the main antagonists in the previous game, and the Thunder God Raiden, defender of Earthrealm. The surviving warriors from the previous titles join forces to confront Onaga. Twenty-six characters are available to play in the game, with nine making their first appearance in the series. Deception contains several new features in the series, such as chess and puzzle games with the MK characters and an online mode. The Konquest Mode returns from Deadly Alliance, but follows the life of Shujinko, a warrior who is deceived by Onaga to search for artifacts to give Onaga more powers. In November 2006, Midway released Mortal Kombat: Unchained, a port for the PlayStation Portable, which adds characters to the game from the previous title. Series co-creator Ed Boon designed Deception to be an unpredictable fighting game, and included new features such as the minigames as surprises. Several parts from Deadly Alliance such as combos and arenas were redesigned to be more realistic as well as more interactive. Deception has been well received by video game reviewers, who praised the fights and the new features. The Konquest Mode, however, received criticism for poor voice acting. Several publications have called Deception the best fighting game of 2004.